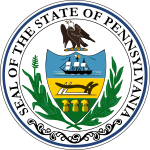 The Mayoral election of 1985 in Pittsburgh, Pennsylvania was held on Tuesday, November 5, 1985. The incumbent mayor, Richard Caliguiri of the Democratic Party chose to run for his third term. Calagiri won by over 50 points in a city where Democrats outnumber Republicans by a 5 to 1 margin. The Republican nominee was attorney Henry Sneath. A total of 81,997 votes were cast. This page was last edited on 15 February 2019, at 01:31 (UTC).